Great looking good quality rain shoes and the service was excellent. Excellent pair of gardening shoes along with excellent delivery time. Very happy with my purchase. The recipient was delighted with her chook Sloggers. Fun design, comfy and very practical around the garden. Great pair of good quality gardening shoes, more than happy with my purchase. 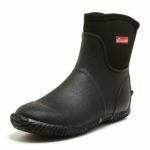 I am very pleased with my new waterproof garden shoes, they are comfy – I got them big enough to wear with socks. I wore them all day, and forgot I was wearing them! I love the colour – Spring Surprise. I had been searching for shoes suitable for gardening and I’m so pleased with my recent purchase. Very comfortable and easy to care for. Best wishes for a happy and healthy 2019 for all your family. 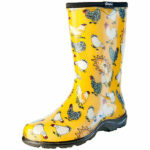 Our daughter was delighted with the bright yellow “chook” sloggers that we gave her for her December birthday. Delivery was speedy, even just before Christmas, and the fit was perfect. Thank you so much for very efficient customer service. Look forward to buying from you in the future. 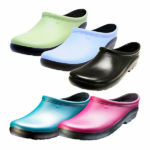 Hi Nat , I’m a nurse & it’s very hard to get theatre clogs that are gorgeous! Practical ! & a great price . My colleagues are all starting to order them ! Only one problem- any more designs coming!!!!!!! I purchased a pair for my Mother for Christmas and of course had to have a pair myself. We both love them. Comfy and practical. Great service.